Plasma-enhanced chemical vapor deposition (PE-CVD) provides an effective alternative for depositing a variety of thin films at lower temperatures than those used in typical CVD reactors without settling for a lesser film quality. A high-quality silicon dioxide (SiO2) film can be deposited at 300°C to 350°C, while CVD requires temperatures in the range of 650°C to 850°C to produce similar quality films. PE-CVD uses electrical energy to generate a glow discharge (plasma) in which the energy is transferred into a gas mixture. This transforms the gas mixture into reactive radicals, ions, neutral atoms and molecules, and other highly excited species. In PE-CVD, the gas phase and surface reactions are strongly controlled by the plasma properties. 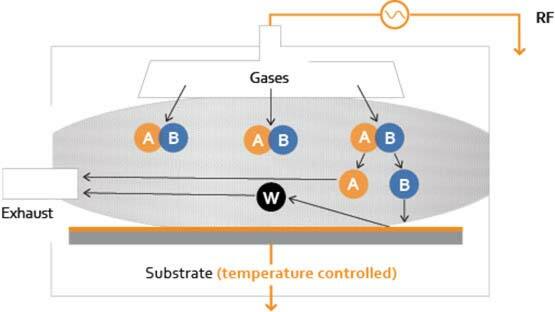 In place of thermal activation, electron impact dissociation of the gas mixture drives gas phase reactions enabling deposition to be carried out at temperatures much lower than a conventional CVD process. For PE-CVD, deposition rates are usually not a strong function of substrate temperature since surface activation energies are often small. However, film properties such as composition, stress, and morphology are generally strong functions of the substrate temperature. Some of the desirable properties of PE-CVD films are good adhesion, low pinhole density, good conformality, and uniformity on planar and 3-dimensional surfaces. PE-CVD’s utility and flexibility lies in its ability to deposit high quality films on a variety of substrates, from silicon wafers to automotive components. Additionally, plasma-enhanced CVD systems provide a lower cost-of-ownership than conventional CVD. 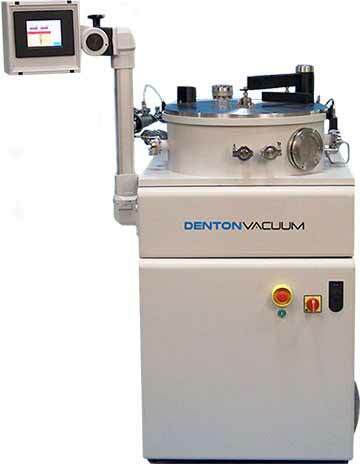 Denton Vacuum specializes in plasma-enhanced CVD (PE-CVD) to deposit diamond-like carbon (DLC) thin films. DLC films are a family of amorphous carbon films that exhibit similar properties to diamond, such as hardness, scratch resistance, and high thermal conductivity. In addition, DLC thin film coatings have attracted a lot of commercial interest because of their biocompatibility, infrared transparency, and electrical insulating performance. Denton has developed proprietary capabilities to extend the range of DLC properties to include, for example, anti-fingerprinting and hydrophobicity. Our Voyager PE-CVD solution offers sputtering in low temperatures with high uniformity. For full details and the data sheet, click through to the Voyager product page below.